Something important is happening in Cleveland: a new model of large-scale worker- and community-benefiting enterprises is beginning to build serious momentum in one of the cities most dramatically impacted by the nation’s decaying economy. The Evergreen Cooperative Laundry (ECL)–a worker-owned, industrial-size, thoroughly “green” operation–opened its doors late last fall in Glenville, a neighborhood with a median income hovering around $18,000. It’s the first of ten major enterprises in the works in Cleveland, where the poverty rate is more than 30 percent and the population has declined from 900,000 to less than 450,000 since 1950. These are not your traditional small-scale co-ops. The Evergreen model draws heavily on the experience of the Mondragon Cooperative Corporation in the Basque Country of Spain, the world’s most successful large-scale cooperative effort (now employing 100,000 workers in an integrated network of more than 120 high-tech, industrial, service, construction, financial and other largely cooperatively owned businesses). The Evergreen Cooperative Laundry, the flagship of the Cleveland effort, aims to take advantage of the expanding demand for laundry services from the healthcare industry, which is 16 percent of GDP and growing. After a six-month initial “probationary” period, employees begin to buy into the company through payroll deductions of 50 cents an hour over three years (for a total of $3,000). Employee-owners are likely to build up a $65,000 equity stake in the business over eight to nine years–a substantial amount of money in one of the hardest-hit urban neighborhoods in the nation. Thoroughly green in all its operations, ECL will have the smallest carbon footprint of any industrial-scale laundry in northeast Ohio, and probably the entire state: most industrial-scale laundries use three gallons of water per pound of laundry (the measure common in industrial-scale systems); ECL will use just eight-tenths of a gallon to do the same job. A second green employee-owned enterprise also opened this fall as part of the Evergreen effort. Ohio Cooperative Solar (OCS) is undertaking large-scale installations of solar panels on the roofs of the city’s largest nonprofit health, education and municipal buildings. In the next three years it expects to have 100 employee-owners working to meet Ohio’s mandated solar requirements. OCS is also becoming a leader in Cleveland’s weatherization program, thereby ensuring year-round employment. Another cooperative in development ($10 million in federal loans and grants already in hand) is Green City Growers, which will build and operate a year-round hydroponic food production greenhouse in the midst of urban Cleveland. The 230,000-square-foot greenhouse–larger than the average Wal-Mart superstore–will be producing more than 3 million heads of fresh lettuce and nearly a million pounds of (highly profitable) basil and other herbs a year, and will almost certainly become the largest urban food-producing greenhouse in the country. A fourth co-op, the community-based newspaper Neighborhood Voice, is also slated to begin operations this year. Organizers project that an initial complex of ten companies will generate roughly 500 jobs over the next five years. The co-op businesses are focusing on the local market in general and the specific procurement needs of “anchor institutions,” the large hospitals and universities that are well established in the area and provide a partially guaranteed market. Discussions are under way with the “anchors” to identify additional opportunities for the next generation of community-based businesses. Evergreen Business Services has been launched to support the growing network by providing back-office services, management expertise and turn-around skills should a co-op get into trouble down the road. Significant resources are being committed to this effort by the Cleveland Foundation and other local foundations, banks and the municipal government. The Evergreen Cooperative Development Fund, currently capitalized by $5 million in grants, expects to raise another $10-$12 million–which in turn will leverage up to an additional $40 million in investment funds. Indeed, this may well be a conservative estimate. The fund invested $750,000 in the Evergreen Cooperative Laundry, which was then used to access an additional $5 million in financing, a ratio of almost seven to one. An important aspect of the plan is that each of the Evergreen co-operatives is obligated to pay 10 percent of its pre-tax profits back into the fund to help seed the development of new jobs through additional co-ops. Thus, each business has a commitment to its workers (through living-wage jobs, affordable health benefits and asset accumulation) and to the general community (by creating businesses that can provide stability to neighborhoods). The overall strategy is not only to go green but to design and position all the worker-owned co-ops as the greenest firms within their sectors. This is important in itself, but even more crucial is that the new green companies are aiming for a competitive advantage in getting the business of hospitals and other anchor institutions trying to shrink their carbon footprint. Far fewer green-collar jobs have been identified nationwide than had been hoped; and there is a danger that people are being trained and certified for work that doesn’t exist. The Evergreen strategy represents another approach–first build the green business and jobs and then recruit and train the workforce for these new positions (and give them an ownership stake to boot). Strikingly, the project has substantial backing, not only from progressives but from a number of important members of the local business community as well. Co-ops in general, and those in which people work hard for what they get in particular, cut across ideological lines–especially at the local level, where practicality, not rhetoric, is what counts in distressed communities. There is also a great deal of national buzz among activists and community-development specialists about “the Cleveland model.” Potential applications of the model are being considered in Atlanta, Baltimore, Pittsburgh, Detroit and a number of other cities around Ohio. What’s especially promising about the Cleveland model is that it could be applied in hard-hit industries and working-class communities around the nation. The model takes us beyond both traditional capitalism and traditional socialism. The key link is between national sectors of expanding public activity and procurement, on the one hand, and a new local economic entity, on the other, that “democratizes” ownership and is deeply anchored in the community. In the case of healthcare the link is also to a sector in which some implicit or explicit form of “national planning”–the movement toward universal healthcare–will all but certainly increase public influence and concern with how funds are used. Consider what might happen if the government and the UAW used the stock they own in General Motors because of the bailout to reorganize the company along full or joint worker-ownership lines–and if the new General Motors product line were linked to a plan to develop the nation’s mass transit and rail system. Since mass transit is a sector that is certain to expand, there is every reason to plan its taxpayer-financed growth and integrate it with new community-stabilizing ownership strategies. The same is true of high-speed rail. Moreover, there are currently no US-owned companies producing subway cars (although some foreign-owned firms assemble subway cars in the United States). Nor do any American-owned companies build the kind of equipment needed for high-speed rail. In 2007 public authorities nationwide bought roughly 600 new rail and subway cars along with roughly 15,000 buses and smaller “paratransit” vehicles. Total current capital outlays on vehicles alone amount to $3.8 billion; total annual investment outlays (vehicles plus stations and other infrastructure) are $14.5 billion. The Department of Transportation estimates that a $48 billion investment in transit capital projects could generate 1.3 million new green jobs in the next two years alone. There are also strong reasons to expedite the retirement of aging buses and replace them with more efficient energy-saving vehicles with better amenities such as bike racks and GPS systems–the procurement of which would, in turn, create more jobs. President Obama has endorsed a strategy for making high-speed rail a priority in the United States. In a January 28 appearance in Florida he announced support for rail expansion in thirteen corridors across the nation based on an $8 billion “down payment” for investments in high-speed rail included in last year’s stimulus package. The administration plans an additional $5 billion in spending over the next five years. Interest at the state level is also strong; in November 2008 voters in California approved a $10 billion bond to build high-speed rail. Even more dramatic possibilities for a new industry organized on new principles are suggested by experts concerned with the impact of likely future oil shortages. Canadian scholars Richard Gilbert and Anthony Perl, projecting dramatic increases in the cost of all petroleum-based transportation, have proposed building 25,000 kilometers (about 15,000 miles) of track devoted to high-speed rail by 2025. Along with incremental upgrades of existing rail lines to facilitate increased and faster service, they estimate total investment costs at $2 trillion (roughly $140 billion each year for fifteen years). All of this raises the prospect of an expanding economic sector–one that will inevitably be dominated by public funds and public planning. In the absence of an effort to create a national capacity to produce mass-transit vehicles and high-speed-rail equipment, the United States in general, and California and other regions in particular, will likely end up awarding contracts for production to other countries. The French firm Alstom, for example, is likely to benefit enormously from US contracts. The logic of building a new economic sector on new principles becomes even more obvious when you consider that by 2050 another 130 million people are projected to be living in the United States; by 2100 the Census Bureau’s high estimate is more than 1 billion. Providing infrastructure and transportation for this expanding population will generate a long list of required equipment and materials that a restructured group of vehicle production companies could help produce–and, at the same time, help create new forms of ownership that anchor the economies of the local communities involved. As reflection on transportation issues and the current ownership structure of General Motors suggests, the principles implicit in the nascent Cleveland effort point to the possibility of an important new strategic approach. It is one in which economic policy related to activities heavily financed by the public is used to create, and give stability to, enterprises that are more democratically owned, and to target jobs to communities in distress. The model does not, of course, rely only on public funds; as in Cleveland it serves a private market and hence faces the “discipline” of the market. We are clearly only on the threshold of developing a sophisticated near-term national policy approach like that suggested for transportation–to say nothing of the fully developed principles of a systemic alternative. The Cleveland experiment is in its infancy, with many miles to go and undoubtedly many mistakes to make, learn from and correct. On the other hand, as New Deal scholars regularly point out, historically the development of models and experiments at the local and state levels provided many of the principles upon which national policy drew when the moment of decision arrived. It is not too early to get serious about the Clevelands of the world and the possible implications they may have for one day moving an economically decaying nation toward a new economic vision. This entry was posted in Articles, Resources for The Next American Revolution and tagged cleveland, co-op, evergreen, the nation. Bookmark the permalink. Both comments and trackbacks are currently closed. "This book offers by far the most serious, intellectually grounded strategy for system-changing yet to appear. It could be the most important movement-building book of the new century..."
More info about What Then Must We Do? "Concrete and feasible ways to reverse the ominous course of the past several decades and to open the way to a vibrant democracy with a sustainable economy… A marvelous book…I recommend it all the time"
"Highly readable; excellent for students…. A tonic and eye-opener for anyone who wants a politics that works." "This book opens an extraordinary new vista on the moral bankruptcy of our second Gilded Age." 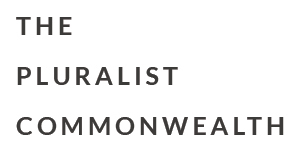 Visit my ongoing archive of material on the Pluralist Commonwealth and related matters of systemic design. How do we build a more democratic, equal and ecologically sustainable society? What can one person do? Read and share "Ten Ways to Democratize the Economy"
An essential short list of the concrete steps we need to take towards a just and sustainable economy.